A customer is an entity (individual, group, society, company, and corporate etc.) who becomes accustomed to buying from the organization. Without a strong track record of contact and repeat purchase, this entity is not the customer, but a buyer. Loyalty is the attachment a customer feels for the employees of the organization, the products and the services. A true customer is grown over time. A loyal customer is one who has the following attributes. Customer loyalty is defined as ‘a customer which over time engage one organization to satisfy entirely, or a significant part, of its needs by using the organization’s products or services’. Customer loyalty means that the customer is loyal to the organization and only turns to a competitor in exceptional cases. The importance of customer loyalty and customer satisfaction has become increasingly apparent to an organization since the industry is facing the situation of oversupply during the recent years. This oversupply condition is bringing to the forth the necessity of building customer loyalty and to have organizational policies which are oriented towards satisfying its customers. Customers can be fickle with their loyalty, and long with their memory. It can be demonstrated by many examples that a single negative incident can ruin a long standing relationship between customer and the organization since there are several viable alternatives are available to the customer in today’s competitive market. Building of the customer loyalty requires the organization to emphasize the value of its products or services and to show that it is interested in building a relationship with the customer. The organization recognizes that its business is to build a stable organization base rather than make a single sale. Customer loyalty is an important determinant for the long term financial performance of the organization. Most organizations are finding that if they do not keep customers satisfied and loyal, competition lures their customers away. But competitors are not the only barrier to customer retention; unmet customer demand for both quality products and friendly and efficient service can also contribute to massive customer exits. Customer loyalty not only improves the organizational efficiency ratio, but it also enhances productivity. If good customers start deserting, the sale volume is likely to remain stagnant because the new customers just replace the customers who have left. And since the defectors probably are the large quantity buyers, the organization might actually see in decrease in sale volume. Increased loyalty can bring cost savings to the organization at least in the following six areas. The following five reasons explain the advantages for an organization for making a first time customer into a life time buyer. The sales of the organization go up because the customer is buying more from the organization. The organization strengthens its position in the marketplace when customers are buying from the organization instead from the competing organization. The cost of the marketing costs goes down since the organization need not has to spend money to attract a repeat customer. In addition, as a satisfied customer he tells his friends which is the cost free advertisement for the organization. The organization is better insulated from price competition since a loyal customer is less likely to be lured away by a discount of a small amount offered by the competing organizations. A happy customer is likely to test use the other product of the organization thus helping the organization to achieve a larger share of the customer’s requirement. When the organization is spending less to acquire new customers, it can afford to pay its employees better. Better pay prompts a chain reaction, with a host of benefits. These benefits include the ability of the organization to retain good employees which results into improved loyalty both inside and outside the organization. Just as customer retention has a positive impact on profitability, customer defection can have negative impact. Defection by a long term customer can cause a dramatic loss and affect the bottom line much more quickly than defection by a new customer does. Hence many organizations have ‘push customer loyalty’ and ‘satisfaction’ as two words that go into its ‘sales strategic plan’. The attachment a customer feels about the organizational product or service is shaped by two dimensions namely (i) the degree of preference, and (ii) the degree of perceived product differentiation. Attachment is the highest when the customer has a strong preference for a product or service and clearly differentiates it from competitive products. An attitude that is weak toward the organizational product or service but differentiates it from the offering of the competitor translates to high attachment and may in turn contribute to loyalty. A strong preference combined with little perceived differentiation may lead to multiproduct loyalty. Also, a positive but weak preference associated with no perceived differentiation leads to lowest attachment, with repeat purchase less frequent and varying from one occasion to the next. Buyers of the organizational products become loyal customers through the following seven stages as detailed below. Stage 1 – This is a stage when would be buyer is a suspect. A suspect is anyone who might possibly buy the organizational product or service. Would-be buyer is called a suspect at this stage since it is believed or suspected that the would-be buyer might buy from the organization. However the organization does not know for sure. Stage 2 – The would-be buyer becomes a prospect at this stage. A prospect is someone who has a need for the organizational product or service and has means to buy. Although a prospect has not yet purchased from the organization, he may have heard about the organization, read about the organization, or had someone who has recommended the organization to him. Stage 3 – Organization disqualify the prospects since these prospects are those who do not need, or do not have the ability to buy the organizational products. Stage 4 – The buyer has become a first time customer by purchasing the organizational product. First time customer is one who has purchased from the organization one time. This buyer can be a customer of the organization as well as a customer of the competing organization. Stage 5 – The first time customer becomes a repeat customer when he purchases from the organization two or more times. Stage 6 – The customer start buying everything which the organization sells and which the customer can possibly use. This customer purchases regularly from the organization and the organization develops a strong, ongoing relationship that makes the customer immune to the pull of the competition. Stage 7 – The customer becomes a satisfied and loyal customer. At this stage he advocates and encourages others to buy the products from the organization. He talks about the organization and does the marketing for the organization. Lost customer is someone who was with the organization earlier but has not bought anything from the organization in at least one normal purchase cycle. When this customer becomes active again, he is regained by the organization but is at risk since there is a high probability of his defecting again. Such customer is only a buyer and not a loyal customer. During the past forty years the economic conditions have been changing due to economic stagnation, higher inflation and increased unemployment. Many markets have settled into maturity. It could be said that the actor who nowadays dominates the market is the customer because focus has moved from the seller to the customer. The trend from transaction marketing towards relationship marketing has been significant in recent years. The main point of transaction marketing has been to focus continually on single sale, sale with short time-scale, to limit the customer commitment and to put little emphasis on customer service. In case of relationship marketing, the focus is on aspects such as customer retention, sale with long time-scale, high customer service, high customer commitment and high customer contact. The comparison leads to the conclusion that a more intensive competition has forced the organizations to take care of and develop existing customer relations. In the present day situation, organizations are more focused on customer retention. Normally it takes several times as much effort, time and money to attract a new customer than it is needed for keeping an existing customer. Long-term relationships with customers are more profitable due to the following reasons. The cost of acquiring new customers can be substantial. A higher customer retention rate implies that fewer customers need to be acquired and these can be acquired more cheaply. Established customers tend to buy more. Regular customers place frequent, consistent orders and, therefore, usually cost less to serve. Satisfied customers often refer new customers to the supplier at virtually no cost. Satisfied customers are often willing to pay premium prices for a supplier they know and trust. Retaining customers makes market entry or share gain difficult for the competitors. Marketing efforts of the organization through customer relationship can be divided into three levels. Each level shows in what way the organization tries to develop higher customer loyalty. These thee levels are described below. First level – It is the monetary level. On this level, the organization uses the price to get higher customer loyalty, for example loyal customers are rewarded with bonuses, special prices or other monetary benefits. The disadvantage of this level is that it rarely results in long term competitiveness. The price is too easy for competitors to imitate, and it becomes difficult for the customer to differentiate. Second level – It is the social level. On this level the organization is also using the price but it combines the price with other benefits that can establish social bonds with the customers. For example the organization organizes dinners, social functions or events, or lectures for their customers. The customers are no longer anonymous, since the organization satisfies special needs and wishes in a personal way. On this level, it is also possible to establish higher trust in the relations and by this achieve a deeper value in the relations. This is difficult to achieve with only monetary benefits. Third level – It is the structural level. On this level the organization also includes besides price and social bonds, structural bonds in the relations with the customers. This means that the organizations offer the customers products that are specially designed for their needs. The third level enhances the customer loyalty and helps the organization in achieving a continuing profitability by adding a higher value to the relations with the customer. 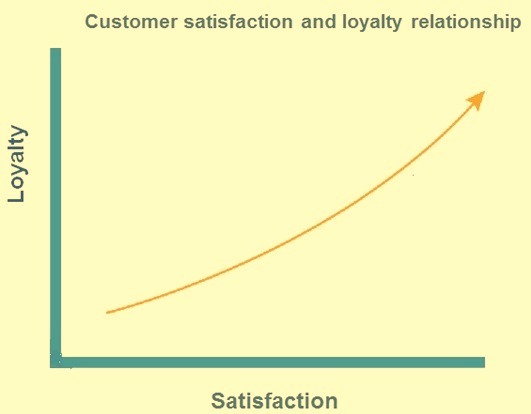 There is a complex relationship between satisfaction and loyalty (Fig 1). Satisfaction is the first tier in the relationship between a customer and the organization. In order for an organization to differentiate itself from the competing organization, it has to move customers from the first tier of this relationship, satisfaction, to the second tier, loyalty. Customer loyalty is not a permanent thing. If the customer value decreases to such a level that it becomes obvious to the customer that offers from the competitor is better, then the organization loses the loyal customer. Customer loyalty is more important for those organizations where repurchase from the customer is important for the survival of the organization. With the right marketing, it is possible to build up a loyal base of the customers having a high frequency of purchases. With a loyal base of customers, the organization can reach a stable market share which consists of a large share of loyal customers who are easier to defend from competitors. After all it costs several times more for the organization to reach a new customer instead of trying to keep an existing customer. Losing a customer means a decrease in the income while the cost of keeping an existing customer often is limited. 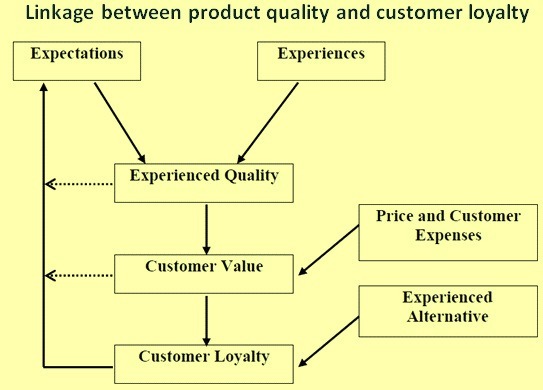 There is a strong linkage between the product quality and the customer loyalty. It is almost practically impossible to achieve customer loyalty if the quality of the product is not maintained by the organization. Fig 2 explains this linkage. Customer loyalty can be classified into four types. The concept of loyalty can be categorized on the basis of the force that provides the loyal behaviour. The categories are graded by how strong the loyalty is. Customers are more engaged in the offer when the grade of loyalty is high and thereby customers are harder for competitors to get. The grades go from enforcement from the outside to inner commitment. The first two grades are easier to create if set in relationship with the other two, but at the same time these customers are easier for competitors to take away. The different types of customer loyalty are described below. Forced loyalty – The obstacles categorize this type of loyalty. The obstacles can be, lack of time, lack of alternatives, or that it is laborious or expensive to change the supplier. Geographical location also influences forced loyalty. In such situation customer is unable to go to the competitor even if there are better alternatives. Bought loyalty – This is consciously chosen loyalty. It is based on some sort of bonus that customers receive in money or discount, if they are loyal. Practical loyalty – This loyalty is due to the customer habit or due to customer convenience. In case of customer habit, it is unconscious loyalty. The customer’s choices are based on routines. Customer always uses one supplier and continues to do so without thinking about it. In case of customer convenience, customer is aware of his loyalty because it is easier and convenient for him to continue with the supplier. Engaged loyalty – This loyalty is due to quality of the product or due to the supplier’s commitment. In case of loyalty due to quality, the customer is aware of his loyalty which is due to the functionality of the service or product. The customers have certain demands on quality that the supplier provides. In case of loyalty due to commitment, the customer is aware of his loyalty which is due to a symbolic value, or status and social values and inner awards. He gets a certain feeling when using the service or product. Further loyal customers can be divided into two main groups, loyal customers and strongly loyal customers. Within the loyal group there are satisfied and unsatisfied customers. The satisfied customers need not have to be loyal but there is a correlation between satisfied customers and loyal customers. There are unsatisfied customers who are loyal. The combination of unsatisfied customers and high loyalty is sometimes called false loyalty. The overall reason for this combination is factors that are obstacles for the customer to choose supplier. These factors are called switching costs, or switching barriers. Based on the assumption that a satisfied customer is a loyal customer, it can be argued that high level needs seem to have the largest potential to create strong loyalty. Pursuing of the market share by the organization can actually go against customer loyalty. This is because a substantial gain in market share can increase the diversity of the customer base of the organization. As a result, the organization is forced to serve an increasingly heterogeneous base of customers with a homogenous set of products and services. This disparity can create a dangerous dynamics within the organization. Due to it, the service and attention once available to high potential customers are undercut and diluted to cater to an increasing assortment of less-promising customers. This creates a paradox for the organization which it must manage to be in the race to win market share and its promise of profit and at the same time not to risk (and often lose) the highest margin customers and in doing so worsens profitability rather than improving it. The organization interested in building a solid, loyal customer base uses an approach different from that of the organization interested in simply building market share. Building of customer loyalty requires the organization to emphasize the value of its products or services and to show that it is interested in building a relationship with the customer. The organization is to recognize that its business is to build a stable customer base rather than make a single sale. Instead of focusing only on increased services, price breaks, or other benefits to first time customers, the organization is to do everything possible to turn first time customer into loyal customers.